Berroco Medina is an ideal dk weight summer accessory and garment yarn. 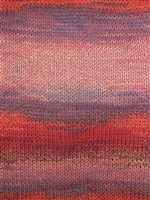 Warm colors ebb and flow in long-color repeats. 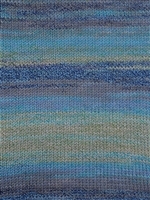 Berroco Medina blends cotton, acrylic, and viscose into gorgeous colors. Enjoy! 100 grams, 295 yard skeins of dk weight yarn. 37% cotton, 36% acrylic, 27% rayon. US 6 (4.0mm). Gauge 22 sts = 4 inches. Machine wash in cold on delicate cycle, dry flat. Note: Due to print effect, some dye may release during washing and drying. The Yarn Attic stocks a lovely variety of yarns from Berroco Yarns.